On a recent episode of Chuck, Chuck was obsessed with cooking for his family. The dish he was preparing to make was called "Chicken Pepperoni." For some reason this fascinated me. I can't actually recall anything else that happened during this episode because I kept trying to imagine this dish in my mind. What could it be? Was it a whole chicken roasted with pepperoni stuck to the outside like a chicken larded with bacon? Was it a whole chicken roasted with pepperoni on the inside? Was it cubed up chicken breast which was fried up with chunks of pepperoni, onion, and bell pepper served with pasta? This picture might suggest that we had a slight earthquake before dinner. Unfortunately (or fortunately I guess) this is just what happens when you try to do anything on our counter. 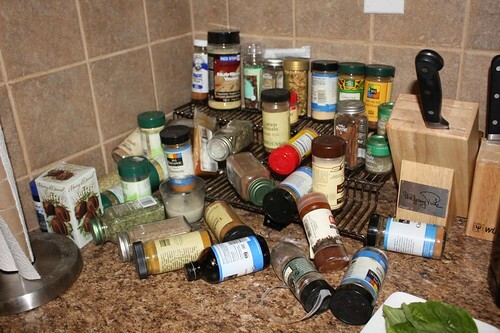 Our spice arrangement is a little less than ideal and while I tried to pound out some chicken breasts this was the result in our designated spice area. I'm open to any suggestions for a better storage option. 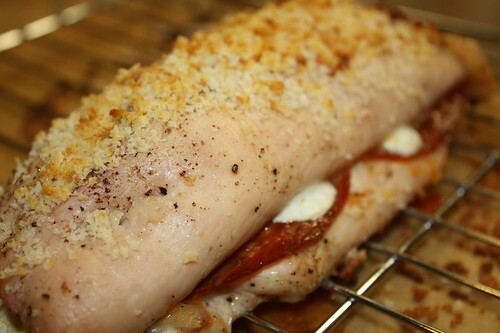 What I ended up doing for this mythical dish was thinly cutting some chicken breast, pounding it out, seasoning it lightly with salt and pepper, and stuffing it with whole basil leaves, fresh mozzarella and sliced pepperoni. I then rolled them up, seasoned the outside with salt, pepper, and olive oil and topped with bread crumbs before roasting in the oven. I served it up with some perciatelli in tomato basil sauce. 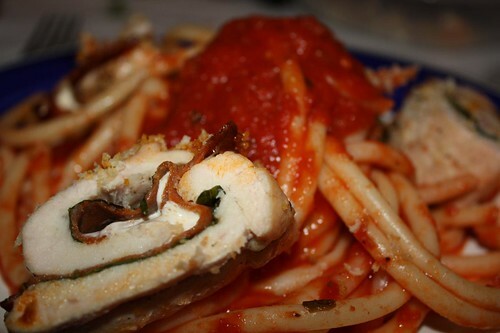 Perciatelli always looks like a good idea until you try to eat it. Because it's hollow all the way through you can't slurp it up like regular spaghetti. It's like trying to slurp up a straw. We didn't get home until about 9:00 PM so it was not likely my most elaborate dinner to date. I opened this bottle of Silver Lining Chardonnay from King Ferry Winery which I got at last summer's 97th Street Greenmarket. Generally chardonnay is a wine I avoid. I've always hated it but my brother-in-law informed me that it is probably the oak it's aged in that I don't like. Wouldn't you know that after trying this unaged chardonnay I was quite impressed. 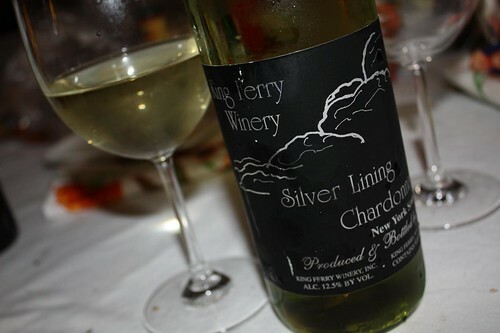 Silver Lining is an appropriate name for the only chardonnay I've ever enjoyed. Now I just need to find an untested recipe from movies and TV to try for tomorrow night to keep up this tradition.